A huge complaint I hear a lot is that it’s impossible to eat healthy on a budget. But that’s simply not true. Sure, fast food is the cheap and easy way to feed your family, but the long-term effects, both on your health, and on your wallet, far outweigh the cost of eating fresh and healthy food. If you’re still skeptical as to whether you can truly eat healthy without breaking the bank, I’ve got a slew of easy tips to follow to save you money on food, while ensuring that what you’re putting on your family’s plates is totally healthy and delicious. Buy “family size” packages of chicken. It’s inexpensive, healthy and a little bit goes a long way. At one time on a few baking trays, coat some with seasoning, others with BBQ sauce, some with dressing and some with spices. Once cooked, you will have these conveniently on hand to use as needed in soups, salads, stir frys and sandwiches for a low fat, healthy option. It’s cheaper (but more tempting) to buy big bags of low fat pretzels, tortilla chips, and popcorn. Invest in a few boxes of snack size Baggies. When you’re NOT hungry, portion out servings according to the package and then grab 1 baggie when you’re ready to snack. You’ll eat less and save more. 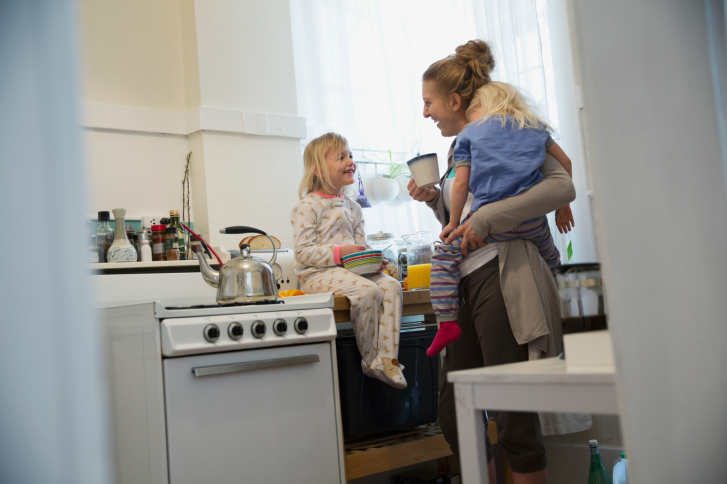 Eating breakfast at home is almost always less expensive and healthier than eating out. For example, at home you can scoop out a bagel and fill with low fat cheese, cottage cheese, peanut butter, cream cheese, etc. You’re cutting calories by scooping and eating far less topping than when you’re eating breakfast out. A portion size of cereal with low fat almond, coconut, soy or milk and fruit is also a healthy and inexpensive option. Breakfast at home can also be a great place to get in a healthy protein shake, or smoothie, which will keep you fueled and focused until lunch. Try serving your meals on smaller sized plates. You’ll eat much less and save money. Eating dinner out can be expensive and the portions can be enough for at least 2 meals. When you cook, you control the amount of fat used in preparation. Substitute broth, water and seasoning instead of all of the oil and butter used when you order some of your favorite meals. For dessert, a single serving fudge pop or icicle has far fewer calories and is much less expensive than going out for an ice cream cone. You can also have a single serving pudding or pudding pop for less than 100 calories and just a few cents. You can try cooking with sprouted or whole grain or low carb/gluten pasta. A box is inexpensive, healthier than regular pasta and you’ll eat much less than the portions served when out. Bring a healthy snack to work. For just a little bit of money, what you bring (yogurt, fruit, string cheese, trail mix) will be healthier and less expensive than what you’d buy when out or from the vending machine at work. Make your own flavored coffee at home. Think about how much you spend on that fancy coffee concoction each day. It can be hundreds of calories and the price adds up over the course of a week. Share an entree or order an appetizer portion. You’ll eat less and save money. Preplan. Bring healthy snacks and water bottles from home if you know you’ll be out for the day. What you’ll bring is almost always healthier and less expensive than anything from outside. Experiment with beans. Beans provide protein, fiber and other important nutrients. They can be used in a multitude of ways and they come in many varieties. A can or bag of beans is also much less expensive than a cut of meat.